“No, no, no, no…. we cannot just buy a new one! Do you think money grows on trees?” I shrink a little when I realize the narrative in my head sounds just like my Dad. This makes me stop and think about some of the ways my Dad taught me the value of money. When I was old enough to get an allowance, he would only buy me a bigger ticket item if I saved half the money for the purchase. This is how I bought my Mondetta sweater and my very first mountain bike. Although the sweater has come and gone with the fashion statements of the late 80’s, the bike is sitting out in my shed right now. Although on its last legs, er… wheels, I maintained that thing for over 20 years. Now THAT is appreciating the value of saving money and taking care of your hard earned belongings. So, I’ve decided the time has come for me to begin teaching my oldest son some early lessons. Chase has been earning half the money we make from returning our recyclables whenever he helps prepare them for the depot. He is responsible for helping to remove the tops from the bottles, counting the recyclables, filling the bags and loading them into the car. He has to go to the depot with his Dad in order to cash in on his hard work. I like that we are teaching him to recycle in addition to giving him the opportunity to work to earn money where he is still a little young to receive a regular allowance. 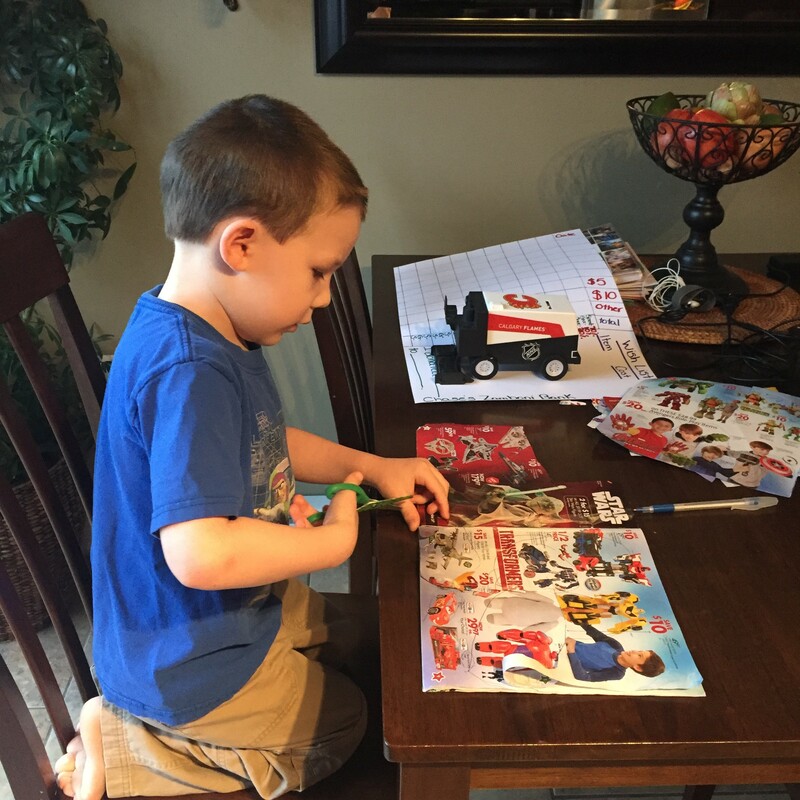 We began by flipping through the old Toys R Us catalog that was lying around from Christmas. I asked Chase to cut out some of the items that he wanted on his wish list. Well… that ended up being about 30 or more items, but hey, it was good scissor practice! The next step was to narrow down the pile of pictures to 10, and then again to 3. That was a process that he did not take lightly. There was much debate going on in that little mind of his and that right there was the start of something beautiful. He decided on the Jokerland Lego set, a Power Rangers robot and the Hot Wheels ultimate garage. It was obvious at this point that he has expensive taste so he would have to work extra hard to save his money. Next, I began to build out a chart on the poster board using markers and a ruler…this of course can be customized any way you wish and honestly, I wasn’t too concerned about making it pretty. Ours included a wish list on the right hand side, rows for the date and columns for each coin and bill. I also made a column for totals and dividing the totals into a spend, save and give percentage. One of the activities we incorporated into creating the chart, was creating impressions of each type of coin to use as headers for the coin columns. I taped the coins face down onto white paper, flipped it over and gave him a colored pencil to rub back and forth over the coin. He was very excited as the imprints of the beaver and boat appeared on the paper. We ended up making more coin impressions than we needed for the chart, just for fun! Once the impressions were complete, he cut them out and glued them to the column headers on the poster board. Next, we continued with the glue and pasted the magazine cuttings under the wish list section. 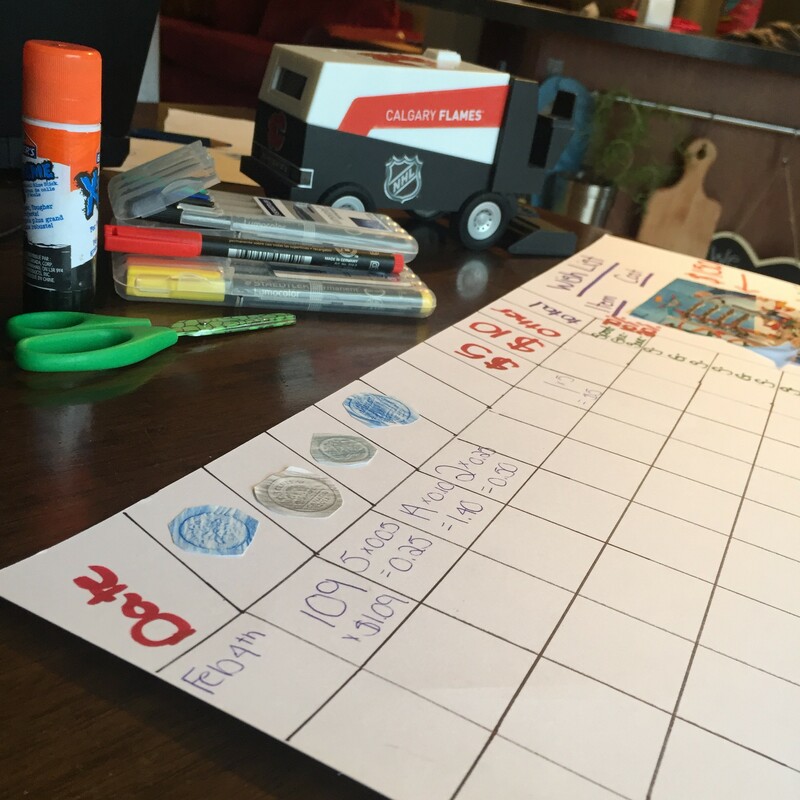 Once the chart was created, the best part was emptying his Zamboni bank, counting each coin and bill and tallying it up on the chart. This of course required some assistance by me and the calculator. 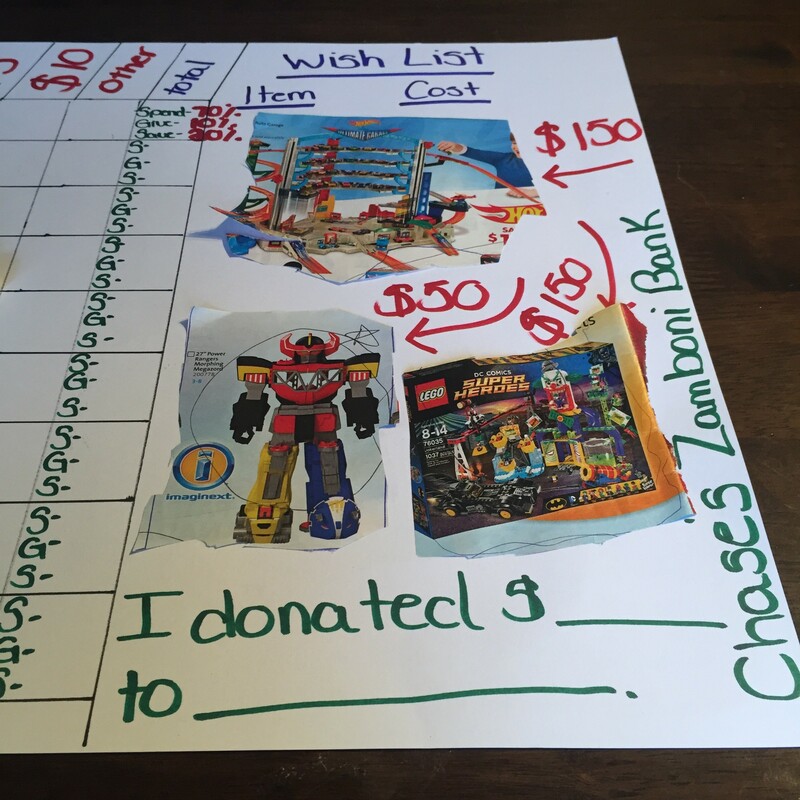 Now that we have our chart built, we have been using it every time Chase earns or receives a monetary gift or has the desire to spend. Each time we count his money and tally it up on the chart, we have the opportunity to talk about his choices regarding his earnings. He will always have a chunk of money available to spend if he wishes, a chunk that he will save and eventually give to a charity that becomes meaningful to him. He will also have a chunk that will be saved until he can afford one of the items on his wish list. I’m looking for ideas and thoughts on how I might someday introduce an allowance, so I’d love to hear what’s been working in your home in the comment section below!